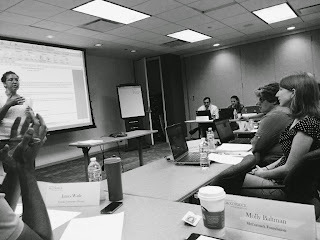 This blog is an update of "Launch of McCormick Foundation's Child Trauma and Prevention Unified Outcomes Project", posted on July 8, 2013. Due to a lack of standardization of outcomes in the field of home visiting, parenting programs, and child trauma, the Communities program launched a capacity building project in 2013 in partnership with 30 grantees funded through Chicago Tribune Charities. The goal of the project was to determine appropriate data to use in evaluating program impact, increase capacity of organizations to use data for decision-making and quality improvement and allow for benchmarking and cross-agency learning through grantee convening. Broadened the standardized data we collect beyond client-level behavior changes (shown through evidence-based tools) to include best practices and program level indicators. Developed a new application and rubric to evaluate programs that take into account grantee input and guidance, and emphasizes theory of change. Provided evaluation capacity building of grantees through learning communities, training, technical assistance and evaluation coaching. Grantees drove the content of the cross-learning convening, evaluation coaching, and group trainings. The next phase of the project is to continue providing opportunities for cross-learning, evaluation coaching and training. We will carry on discussions with public and private funders regarding interest in collaborating, and are partnering with Loyola University to study the impact of the evaluation coaching model on the individual grantees involved. 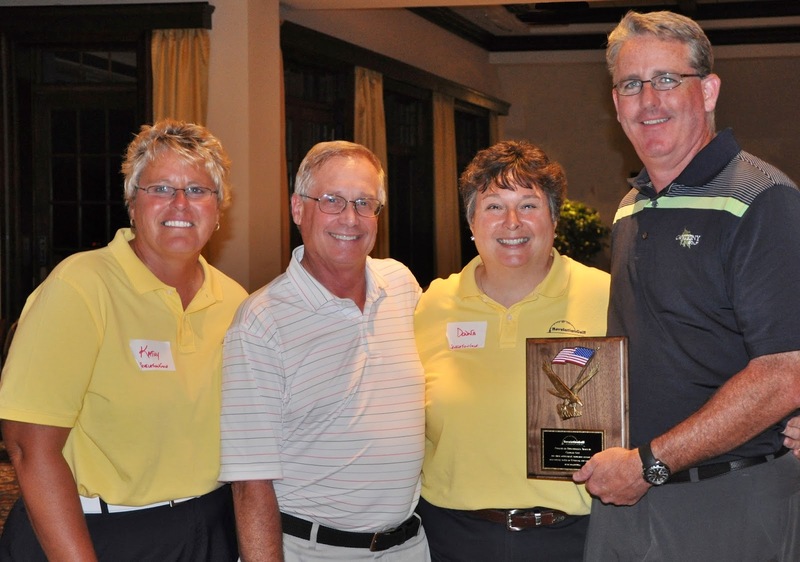 In June, Cantigny Golf was pleased to receive RevelationGolf’s Humanitarian Award for its work helping veterans through their rehabilitation programs at Cantigny. Elk Grove-based nonprofit RevelationGolf is small but it does big work, especially with disabled veterans. Cantigny Golf has been a RevelationGolf partner since 2010, conducting monthly clinics for veterans with disabilities. The clinics serve veterans from Edward Hines Jr. Veteran Affairs Hospital in Maywood and Jesse Brown Veteran Affairs Medical Center in Chicago. Cantigny’s head golf professional, Patrick Lynch, works with veterans personally and considers it an honor. The partnership with RevelationGolf shows once again that golf is more than just a game – it can be transformative. Some of the veterans are just getting back to golf while others are new to the game. Some participants are blind or struggle with PTSD. Many rely on modified and adaptive equipment. But for all players, RevelationGolf is proving that golf can be highly therapeutic. Without RevelationGolf, many veterans might never benefit from the euphoria of experiencing the game — something that looks so simple to most of us but is potentially life-changing for others. At the very least, a little time on the range with the team from RevelationGolf can bring joy to a veteran’s day. Nationally, there has been a great effort to increase funding for early education programs to increase enrollment of at-risk children into high-quality programs, such as Head Start. However, recent research highlights that once children are enrolled in preschool, they must also regularly attend to reap the benefits. A study conducted by the University of Chicago Consortium on Chicago School Research, in collaboration with Chicago Public Schools, found that preschool students who are chronically absent – meaning they miss 10 percent or more of enrolled school days – have lower levels of math, letter recognition, and social-emotional skills by the time they enter kindergarten than children who attend regularly. In the 2011-12 school year, 45 percent of 3-year-olds and more than one-third of 4-year-olds were missing this much school – equivalent to three weeks. Moreover, for a portion of these students, preschool is the beginning of a pattern that continues well into the elementary school years. The reasons for absences vary, but health of the child and family members is the leading reason why preschoolers miss school. Some families struggle with logistical obstacles in getting their children to school, including transportation and child care. Poor school attendance, beginning in the earliest of years, is one of the first indicators that a child may be struggling at home and at school. It is a call for individual outreach by teachers and program staff to families, to understand their particular struggles and barriers to school attendance. Expressing to families that program staff care can be a monumental first step in redirecting a child onto the path of success. But early attendance is not just an indicator of a problem. 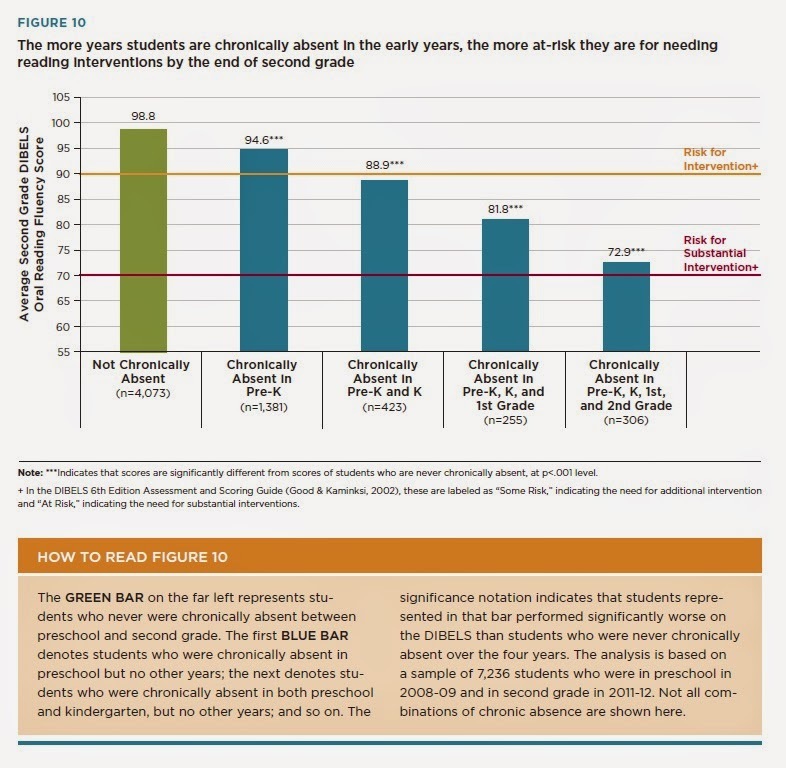 It can be a powerful lever for putting children on a path toward later success, including better attendance and better grades in third grade and beyond. Today, the Illinois Civic Mission Coalition (ICMC), convened by the McCormick Foundation, announces nine new Democracy Schools. Since 2006, the ICMC has recognized over 30 high schools throughout Illinois who have demonstrated deep commitments to civic learning across the curriculum, in extracurricular activities and through student voice in school governance. These efforts must target cities, suburbs and rural areas to reach the ever-diverse student population. Our democracy’s health is dependent upon equitable civic learning opportunities. Civic learning is not merely the concern of civics and government teachers, but the entire school faculty. Principals should lead a vision for their schools’ civic missions and create space for their faculties to align civic learning with Common Core. Teachers across disciplines need ongoing access to professional development opportunities emphasizing both civic content and pedagogies. Schools must bring community partners into their buildings to work with students and teachers, but also send students out in service of their communities. Schools should practice the democracy they teach by incorporating all stakeholders’ voices in their governance, modeling effective civic engagement and nurturing its development among students. The ICMC is growing a self-sustaining network of Democracy Schools committed to students’ civic development. This network increasingly reflects the state’s geographic, racial, ethnic, and economic diversity. Through rigorous research and evaluation, its practices prove that civic learning can flourish in every corner of Illinois, and among all student populations. Letter originally published in the Chicago Sun-Times "Letters to the Editor" on September 12, 2014. Can a struggling student at a school in one of Chicago’s underserved neighborhoods be successful? We believe the answer is “yes” and there’s research now that shows the way. Obstacles can be addressed if students have a mentor. A mentor can model good decision-making and problem-solving skills that can have a huge impact on a young person’s life. Mentors serve as living testaments to the rewards of staying on the right track, and helping students visualize a bright future. The need is big. Some 400,000 kids began a new school year in Chicago this month. Most of them lack sufficient economic support. About 85 percent of Chicago Public Schools students receive free or reduced-price meals. These kids often face some big hurdles, such as housing, incessant hunger and one-parent-families stressed by abuse or incarceration. Then there is the neighborhood violence in Chicago. A rigorous 2013 study, “Preventing Youth Violence and Dropout: A Randomized Field Experiment,” by the National Bureau for Economic Research (NBER) found that participation in Chicago’s “Becoming a Man” program reduced violent-crime arrests by 44 percent and non-violent arrests by 36 percent over the course of the school year. A key component of “Becoming a Man” is mentoring, and NBER also was able to project markedly higher rates of high school graduation for these students as a result of their increased academic engagement. Many groups coordinate successful mentoring programs in the Chicago area. City Year Chicago reports positive outcomes when placing AmeriCorps members as mentors and tutors in schools to provide the consistency and support students need to feel engaged in learning and invested in their futures. Corps members are now in 21 schools throughout the city. Last year, 62 percent of targeted students improved their behavior assessments and 77 percent showed improvements in their academic assessment scores. Mentoring is a key ingredient to ensuring Chicago youth can see past the violence to a life as educated, informed and engaged citizens. Every child needs someone to emulate if they are to develop their potential to become leaders and be their own best advocates. This means Chicago needs a surge of caring adults. It’s time to prioritize an approach that works. We need more people, especially young adults, to step forward as volunteer mentors and join with the city’s philanthropic community to expand support for our at-risk students.